Over 3,000 leaders, including more than 50 heads of state, last month descended on the mountain town of Davos for the World Economic Forum’s Annual Meeting 2019, under the theme Globalization 4.0: Shaping a Global Architecture in the Age of the Fourth Industrial Revolution. Among them were a delegation of 20 pioneering Schwab Foundation Social Entrepreneurs, coming from every continent, and representing some of the world’s leading organizations tackling entrenched social issues with innovative market-based solutions. The social entrepreneurs at Davos are already impacting millions of those in need around the world: providing financial services to the "un-bankable"; ensuring healthcare access in Sub-Saharan Africa; and making strides to clean up our oceans of plastic; to name but a few. Despite the progress that social entrepreneurs are making, they often describe their impact as a drop in the ocean. The week spent at Davos is an opportunity to turbo-charge their impact through partnerships with some of the world’s largest corporates, key governments and civil society organizations, and to showcase their work through global media exposure. High on the agenda this year was the push towards a more “circular economy”. With 13,000 pieces of plastic litter found in every square kilometre of ocean, there has never been a more pressing time to reinvent traditionally linear modes of production. 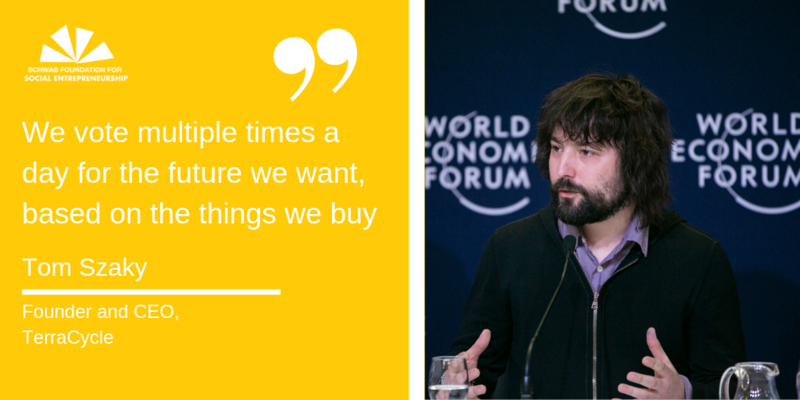 Tom Szaky, Founder and CEO of TerraCycle, announced a major new initiative, called “Loop”, in partnership with some of the world’s largest plastics producers: Unilever, Nestlé and Suez among others, to design packages that can survive at least 100 re-uses. In a first for a Latin American Schwab Foundation social enterprise, Gonzalo Munoz, Founder of TriCiclos, won the annual Circular Awards. TriCiclos is spearheading innovative recycling solutions in the region and changing cultural norms around reuse and recycling. Yves Moury, CEO of Fundación Capital, along with Raj Panjabi of Last Mile Health, were selected during the Annual Meeting to join Co-Impact’s ambitious initiative to improve the lives of 9 million people around the world. Each organization will receive grants to help scale their proven programmes to boost the income, livelihoods and health of those most in need. Yasmina Filali, Founder of Foundation Orient-Occident, emphasized the need to address the dire situation of migrants in the Middle East and North Africa on various platforms. In her interview with the Middle East – Rudaw network, as well as a EuroNews televised session called “Global Migration: Managing Flows, Not Crises”, she highlighted her groundbreaking work in refugee integration in Morocco, and shared her views on how 4IR technologies, better frameworks, and governance can address the migration problem. Thorkil Sonne, Founder and Chairman of Specialisterne Foundation, and Chairman of Denmark's Council for Corporate Responsibility and SDGs, represented the voices of millions of people worldwide who are affected by disabilities, such as autism, and are either unemployed or underemployed. The Annual Meeting provided a platform for Thorkil to underscore the need to build more inclusive societies and workforces; and the potential to uncover and utilize the hidden talents of people with disabilities. Neelam Chhiber, Managing Director of Industree/Mother Earth, used the platform of the Annual Meeting to tackle the obstacles related to skills development and job creation that India is faced with. She shared her ideas about a model of distributed ownership, whereby an enterprise is owned and run jointly by its members, who then share its profits and benefits. It offers robustness, flexibility and massive scalability – all of which are ingredients that can contribute to inclusive growth. These are only a few of the accomplishments of Schwab Social Entrepreneurs at the 2019 Annual Meeting. It is only the beginning. The community members are committed to building on the partnerships formed and the conversations started, to collectively deliver results that will shape our global architecture for the better.